Back in 1997, Oddworld Inhabitants made a 2D side scrolling puzzle game for PS1 and DOS/Windows called Abe’s Oddysee. I tried the demo when it was new, and since then I remember thinking that I’d like to play the full game. I never got around to playing it, or it’s sequel, Abe’s Exodus, though. So when the HD remake was announced, I was definitely interested. Escaping the the plant you work in (Rupture Farms) never looked so good! 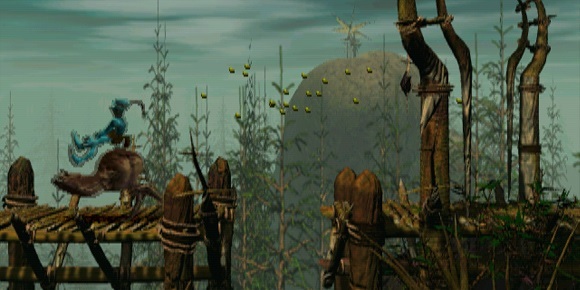 Only having foggy memories of what Abe’s Odysee looked like, I still could see that New ‘n Tasty looked really nice! When I went back and looked at some screen shots, I was even more impressed. This game is no hi-res re-render. This game was completely remade from the ground up. You play the role of Abe, who is a Mudokon that works at a meat processing plant. Everything was fine, until one night while working late, he eavesdrops on a meeting about the next meat product. MUDOKONS! With this knowledge, Abe’s mission is to rescue as many of his brethren as he can, while also escaping his dank meat prison. As I started the game, I continued to be impressed by the sharp graphics and fluid animation. I thought I was really going to enjoy this game. Unfortunately, things don’t always turn out as we would hope. Will this game sell well enough to warrant a 5th game in Oddworld? Navigating the areas, and saving Mudokons instead of letting them die, can be a test in patience and resolve. Timing the traps to crush or drop your enemies, the guards who are looking for you, can involve a lot of trial and error. You’ll have to watch a guard for a bit to see his pattern, try the lever a few times to see how long it takes to engage, and plan your timing accordingly. Even worse are the bombs placed on the floor with a large button on top that flickers red and green. If you push that button when it’s red, or touch it in any other fashion, you’re a goner. I found timing it to be green when pushed to be very difficult. Most times I would just keep trying until it worked, 7-8 deaths later. Overall, I experienced more frustration than fun. I wish it weren’t so, as the game world is very interesting and fun to see, despite how ugly most creatures in it appear. I appreciate the quicksave that was added in this edition, and the fact that the game is intended to be released on the Vita and PS3 with Cross Buy, so one purchase gets you all 3 versions. Overall though, I don’t see it being a game I will return to. I’m willing to bet if I had played that PS1 game back in the later 90s, I would have really enjoyed playing it again and looking better than I remembered it. Sadly, despite the improvements to the game and the visuals, it just feels too dated to enjoy without nostalgia. Full disclosure: Game code provided by the publisher. It is available now on PS4 for $29.99, with PS3 and Vita versions (included in cross-buy) available in the near future. PC, Mac, Linux, Wii U, and Xbox One versions have also been announced, with no dates given. -Good graphics, comparable to the console Arkham games. -Fun gameplay, same great fighting mechanics. -Plenty of collectables and side mysteries to solve. -You may have the feeling you’ve done all this before. -Side view perspective and controls in a 3D world can make the player feel handcuffed at times. -Seriously weird bugs that can get in the way of fully enjoying the game. Batman: Arkham Origins Blackgate is available in physical media and digitally for the PS Vita and Nintendo 3DS and retails for $39.99 on both platforms.